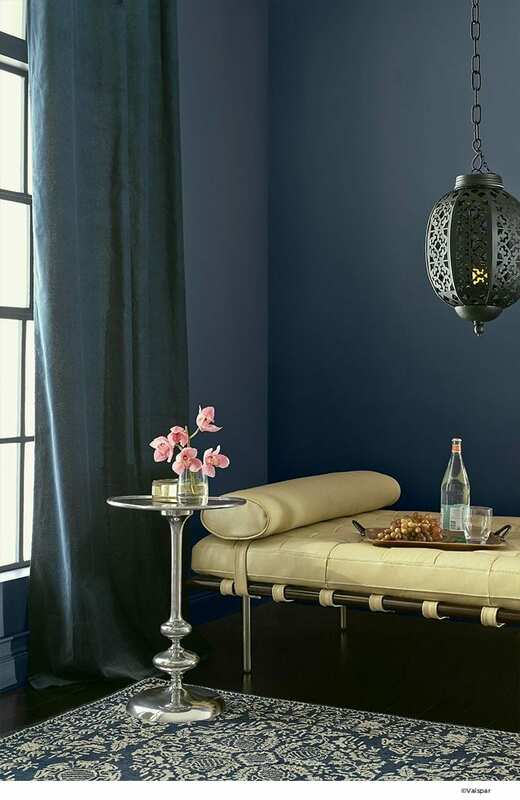 Dark features walls, particularly those in blue, dark grey and almost black have become very popular this season. Mix them with some of the big trends like copper and metallics or some marble, and you have a very striking scheme. But how do we make these colours work in our home? What if we’re feeling a little wary of something so dramatic? Here are some of my thoughts on decorating with inky blue and how to make this look work for you. Ok, so if you like this colour it’s probably best to go for it. Be bold and daring in your choices. Make a moodboard before you begin so you know what you’re aiming for and can visualise the end result. Decide if you want to use paint or wallpaper for your walls, both are available in this stunning shade, and then think about the kind of feel you want the room to have. 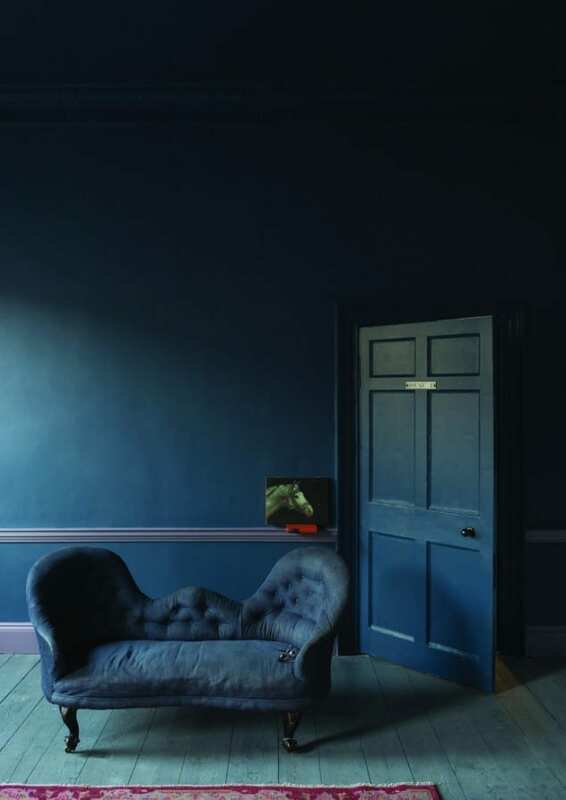 Many people think blue can be cold, and rightly so, but inky blue is rich and warm and very moody, it’s perfect for bedrooms and dining areas I think. Definitely think about a contrasting colour like yellow, orange or bright pink to liven up the space. Painting alcoves, bookshelves and even door frames in a different colour can really lift this inky blue into another sphere. Don’t be afraid of trying out a mixture of brighter shades too. Of course adding them in via your soft furnishings is perfect. I like the selection of duvet covers from Tesco for example, if you’re decorating your bedroom in this style. Easy on the purse too. A colour this dramatic and intense can seem a little overpowering so as well as thinking about using pops of colour, think about how to add in pattern and print too. The detailing will help break up the flatness of the colour and give the room a more playful, less serious feel. Another way to eliminate the flat, intensity of this hue is to break up the wall with wall art. Hang anything you like, maybe picking out a unifying colour or metallic in an eclectic format, using plates, family photos or kid’s art. Creating wall collages like this is such an enjoyable way to inject your personality into your home too. What do you think of this colour? Could you use it in your home? I like the bedroom. I will show this to my wife and she will love it too. Great post! I wouldn’t have thought dark colours like this could look so good! Thanks for sharing and inspiring me. Love it! I like the combination of inky blue and yellow accessories – it looks sophisticated! I love the use of dark walls in the right spaces! I think bright and airy isn’t always the best use of space so I’m glad to see this trend is catching on! I love inky blue.Its very good for rooms.You share nice idea.thanx for this. Yes, we are using the dark blue/gray paint color in a few rooms and are LOVING it! I agree that the Wall Art just POPS on this color – Yellow, White, Light Gray! Always be bold. If you are confident in your choices I feel it makes the room look far stronger and more clinical.